After absorbing an impact on his right shoulder, Barangay Ginebra guard Scottie Thompson momentarily got sidelined amidst his team's rally in the fourth quarter en route to a come-from-behind 91-90 win. The fiery rookie guard delivered 14 big points to help his team turn the game around after being down by as much as 22 big points. Majority of the viewers even consider him as the one who started the run for Ginebra. Well, they're right as he was hailed as the best player of the game after the final buzzer. 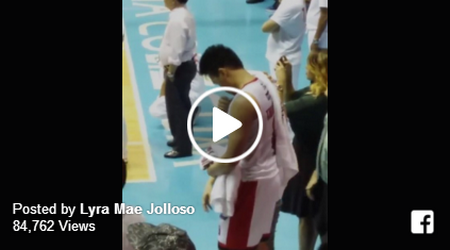 On top of that huge effort, Scottie prayed for his team while he was on the bench. What he did speaks volumes on how much he wants to get the victory for the fans even if he's on the bench nursing his banged up shoulder. Take a look.